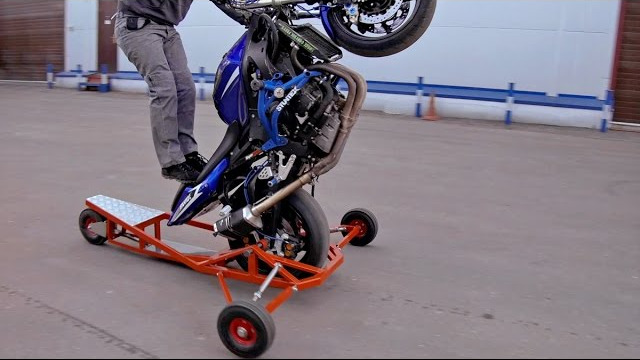 For stuntriding fans, who want to try to do basic stunts safely and understand the basic principles, we have a stationary wheelie-machine and a mobile stoppie-machine. These machines work great as an attraction for anyone who has never sat on a motorcycle, and for motorcyclists who want to understand the basic principles of wheelies and stoppies. After a few lessons, many of our students could do a power wheelie on the road. For their further growth, we have created a more advanced simulator: wheelie-spider. Wheelie-spider is not a simulator, like a wheelie-machine, but an insuring mechanism that does not allow to roll over and fall on the side. With the spider, the motorcycle does wheelie on the road naturally, but with a limited lateral inclination. You can change how far you want to go in the slope, that depends on your level. Wheelie-spider allows you to naturally but safely try to lift the motorcycle and try to balance. When turning, the motorcycle does not stop or falls to the side, but continues to ride. After mastering lifting and landing the bike back using the rear brake, it makes sense to train the transverse balance. Side pulls can be configured so that the bike will go to the side, so you will have to keep the transverse balance. This is the final step in mastering wheelie. Blueprints costs 120EUR, wheelie spyder costs 680EUR.